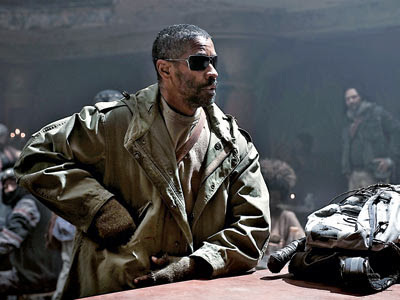 CJ Thomas posts his take on the movie and particularly about star Denzel Washington's opinion about what some might consider to be The Book of Eli's inherent "controversy". Meanwhile on the same site Mike Parker ponders whether The Book of Eli is a Christian movie at all (and his perspective is one that I think all of us who profess to follow Christ and also create media content should ponder greatly). Christian romance author MaryLu Tyndall has a GREAT review up on her blog Cross and Cutlass, and she also encourages fellow Christians to see this movie in spite of its violent content and occasional profanity. Randy Thomas echoes a similar sentiment in his review. Some of these write-ups might have spoilers for the movie, so consider yourself forewarned if you haven't seen it yet. Found any more Christians talking on the Intertubes about The Book of Eli? Feel free to post the links in the comments!